Delicious as part of a brunch buffet, or even for dinner, this casserole is a sweet and savory crowd pleaser. We procured our breakfast sausage from Thomson’s Custom Meats in Twisp, WA. 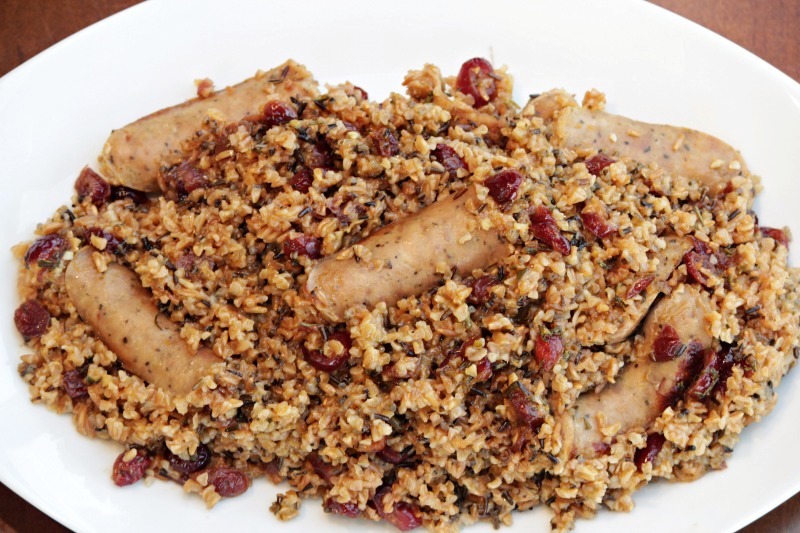 In a 9×13 baking dish, combine the pilaf, garlic, cinnamon, rosemary and cherries. Heat the broth until it is hot and mix in the mustard, syrup, salt and pepper. Pour the broth mixture over the pilaf mixture, and place the sausages evenly over the surface. Cover the dish with foil and bake for 50 minutes. Remove foil and bake 10 minutes more, or until all liquid has evaporated. Turn the oven up to broil, and broil briefly, just to brown the tops of the sausages. Remove from oven and remove the cinnamon stick before serving. Serve as is, or with additional maple syrup if you prefer a sweeter breakfast.